Today was a craft day. I have some letters to write to friends, so I decided to make some customised writing paper. 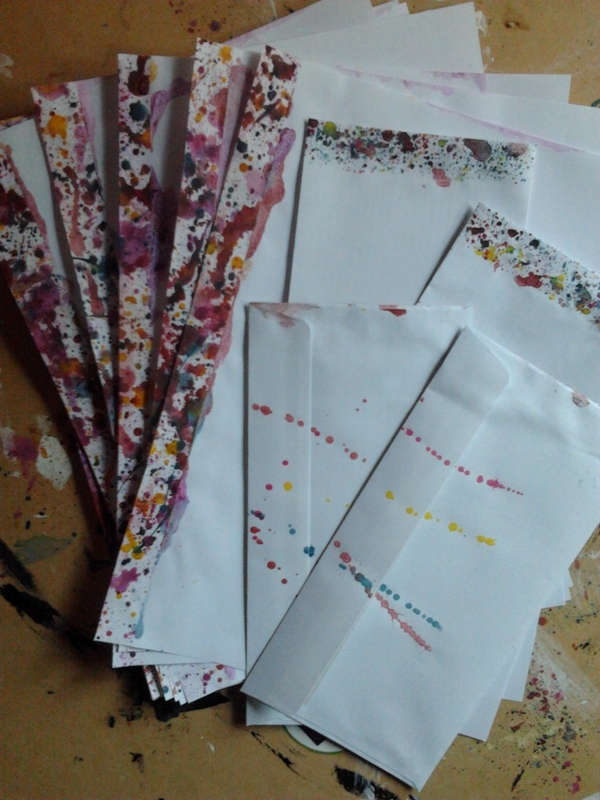 This was a pretty spur-of-the-moment thing, so I just used A4 printer paper and white office envelopes. If I do this again, or decide to make paper for other people, I’ll use fancy paper in that weird letter size. This was fun and really easy, I just laid out a few pieces of paper so that each one had an inch or so showing at the edge. Then I painted my designs. When you separate the stack (discarding the top page which gets covered in paint all over), each page has a neat abstract border. 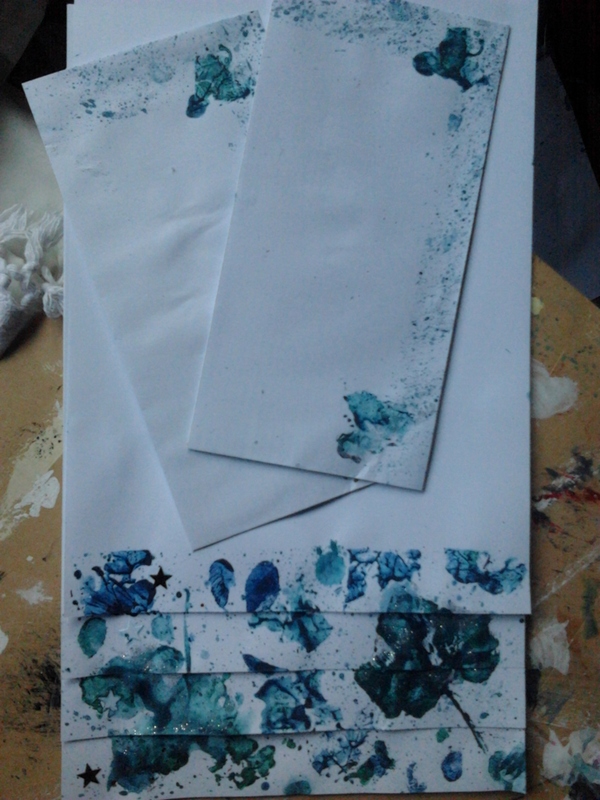 Made some envelopes to match, picking up an element of the main design but keeping it a lot more basic. I feel like If envelopes are too visually busy, the post sorters might get distracted from the address and then my letters will get lost. I think in reality the Post Office are more competent than that, but I don’t want to risk it. This design was great fun, and even managed to spread to my bedspread. A sheet of wood on top of a bed makes a great art table, but you should probably cover up any exposed bedclothes before you get to work. I think using the same design at different scales on the paper and each side of the envelopes makes this paper really visually interesting. You can see in the picture though, some of the more watery paint seeped under the edges of the paper, spoiling the clean line of the border. 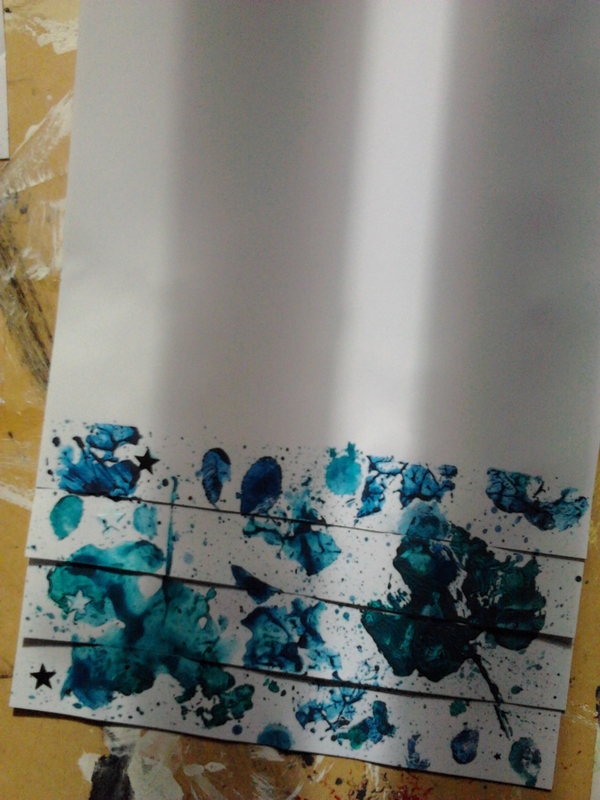 If I do this again I’ll put it on a downward slope when I paint, so any drips run away from the clean paper. They say that letter writing is a dying art, but I don’t think we should let it go. A hand written letter, on hand painted paper, can’t help but be more meaningful than a text or email, even if you format in pretty pictures and fancy fonts. I think I recommend this easy craft project, as it is very simple, requires no fancy materials, and can be adapted to suit anyone. Whatever art or craft things you have, you can use. If you can paint with more competence than I did, and present it in a cute box, a handmade letter writing set would make a sweet handmade gift. You can customise it completely to suit, and I’m sure that hipsters will soon have a revival of the retro art of letter writing, making this a totally relevant way to spend your time.